On Sale Now! 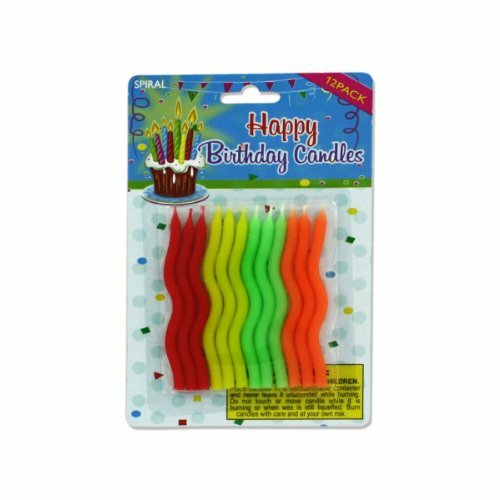 Save 10% on the Spiral birthday candles, Case of 108 by bulk buys at Your Daily Food Choices. MPN: PB123. Hurry! Limited time offer. Offer valid only while supplies last. Spiral birthday candles are a fun and stylish way to decorate a celebration cake. Perfect for birthdays, anniversaries or other special occasions. Spiral birthday candles are a fun and stylish way to decorate a celebration cake. Perfect for birthdays, anniversaries or other special occasions. Colors include red, yellow, green and orange. Each pack comes with 12 candles (3 of each color). Comes packaged on a blister card with hanging hole. Keep out of reach of children. Candles are 3 1/2" tall. Approximate Package Weight: 17.28 lbs.